Let's hear it for therapists who crip! Isn't it great when philosophy is actually a basis for real life? I often heard in women's studies that the personal becomes the political and vice versa. This disability-friendly motto once again showed its applicability last week when I went to the infamous wheelchair clinic. Now those of us who know anything about being fitted for a wheelchair know that the experience can all but drain you of all your sense of disability-groundedness and pride. You may enter the portal with all your personhood in tact, quirks and all. But the minute you enter the threshold of the examining room, a metamorphosis takes place right before your very senses. You literally become a diagnosis, a pathology, a criteria of deficits and incongruencies of the human body. Having gone through this experience several times, I brace myself by letting all the disability studies theories about normalcy run through my mind. At one point, I was so into my own head that the wheelchair vendor had to snap me out of my DS trance and say "Carol, did you hear what we said?" Upon which I replied, "Oh sorry, I wasn't really listening." From this point on, I tried to focus and give credence to these onlooking men and women who after all did go through six years of college to get various degrees that would serve them well in critiquing my body as well as many others. I have to however humble myself and admit to the error of my ways. Skepticism has its place but it should never monopolize one's faith in the possibility of change. The young therapists sat patiently as I did listening to the pontification of the vendor as if he were God him or herself, who had created me and knew every intricacy there was to know. After we heard the commandments of proper seating and the type of chair that would miraculously enable me to sit as erect and normal as possible (I don't think I ever used the word normal in stating what I wanted). Anyway, the two novice therapists looked at me with a very coy but all-knowing expression and simply said "Carol, what do you think? How are you most comfortable and productive in your sitting?" I explained to them and even showed them what they termed as the quad-sling (that's when you drape one of your elbows over the back of your wheelchair) along with being very sleek looking, it is quite comfortable. After my demonstration, the therapists who have the power to prescribe said to me "That's what we thought, Carol." If I could have, I would've given them the biggest high-five and I think they know that. It was such as great day from thereon in because I realized that somewhere in the world, mainly in the city of Philadelphia, there are two therapists who get it. The body is not void of its own peculiarities and the disabled body is a wonderful example of resisting the norm and inventing a style, functionality and fluidity which has an intergrity that cannot be defined or captured by scientific or medical principles. Disability Blog Carnival #42 is up now! In Douglas Adams's Hitchhiker's Guide to the Galaxy, "42" is "the answer to life, the universe, and everything." In the series of Disability Blog Carnival editions, "42" is a breezy summer compilation from Greg at PittRehab, with crashing waves, wonderful dogs, cute kids, cruise ships, kayaks, a trip to Germany... and because this is real life, you'll also find heedless planning, frustrating airlines, staring campers and summer school. Ah, summer. Next edition will be hosted by cherylberyl at Disaboom on August 14 (yes, a three-week stretch, no excuse not to post something, eh?). Still waiting to find out the theme--when I know, you'll know. Submit links by all the usual channels--the blogcarnival.com page, comments here or there, or just put the phrase "disability blog carnival" in your post, I usually find those too. UPDATE: Cherylberyl says the theme will be "Adjectives." Hmmmm! That should be a theme anyone can work with. Can't wait to see what spins out. Maybe some of the fine medievalists blogging about disability history can help with this one: I saw reference to Hermann von Reichenau's birthday today (the Catholic Encyclopedia gives the date as 18 February instead; still, five years till his 1000th!). The son of a nobleman, he didn't walk, and was hard to understand when he spoke, so the assumption is usually that he had CP or something similar. He was called "Hermann der Lahme," or "Hermannus Contractus" or Hermann the Lame, Hermann the Twisted. 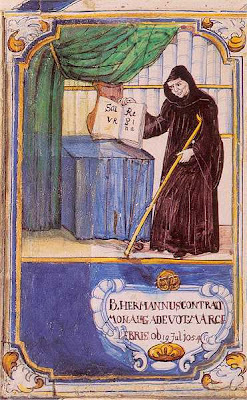 At age 7 Hermann entered the monastery at Reichenau. There, he became an expert on Arabic mathematics and astronomy, composed hymns and poetry, and wrote historical chronicles and treatises on music theory and math games. He seems to have introduced the astrolabe to central Europe, among his other accomplishments. The relics on display here seem to include part of Hermann's skull? Am I seeing that right? If you're the person who arrived at DS,TU today by googling "how to play level 23 crip rader"--apologies, and good luck. We have absolutely no game tips for you. But if anyone ever develops a game named Crip Rader, we'd maybe be interested in having a look. Anatomy of a search-string mishap: Crip, level, and play aren't uncommon words on our blog; rader pick up a reference to Laura Rader, a book illustrator, in this February 2007 post about author Jane Yolen. Hmm! In growing up, when I would attend weddings or celebrations, my relatives would well-meaningly say "come on Carol, let's dance" and they would swoop me up in their arms and dance with me. Even as a child, I was very uncomfortable with this form of dance. Not so much by the gesture but more about my immobility, being inserted into the arena of movement ... of dance. I was so glad that I grew up in an era where going to the dance didn't mean dancing at all. The really cool kids would just stand, or in my case sit, along the wall and be cool... ya know, just be all knowing and too cool to dance. This generational tradition was my saving grace. My disability blended in perfectly. I could just gossip, throw around some profound wisdom that I had no clue what I was talking about and just be cool with the rest of the on-lookers of those who really thought that dance was for dancing. It wasn't until many years later that the dreadful dance was once again in my social domain. I attended my first Society for Disability Studies conference. I heard so much buzz about this event called The Dance but I figured it was just a social culmination of the conference, probably an event for schmoozing, hooking up and impressing fellow academians, dropping the title of your latest article or book that was about to go to press. Much to my horror and downright fear, the dance was actually a dance. People jirated in all forms and styles with whatever part of their body that they could move and they chose to move. I remember very carefully selecting a table back by the wall and making sure that I had a tall glass of of beer with a straw that I could drink independently from. This was my fortress. I could just look and appreciate the chutzpah of my dancing peers or my peers that had a lot more fluidity than I but my destiny was not to escape. A friend of mine who I admire immensely spotted me trying very hard to look nonchalant and engrossed in doing nothing. I knew when she swung her chair in my direction that there wasn't any way out. I either had to show my political disability arrogance by dancing or be found out as a hypocrite. I was right, Simi Linton gave me what I fondly refer to as "The Linton Test." So, after all these years, there I was on the dance floor shaking my head, letting my arms flail and acquiring the skill of the tounge dance. I survived the dance and to be honest I still can't say that I'm a convert. Everytime I attend the SDS dance, I have feelings of ambivalence but since I always have to make sense of everything, I think the dance whether one is enthralled by it or more lukewarm is a political statement that represents evolution of an oppressed people. The dance is a montage of anger, joy and liberation I know those of you reading this blog are probably saying "Carol, why don't you just shut up and dance." 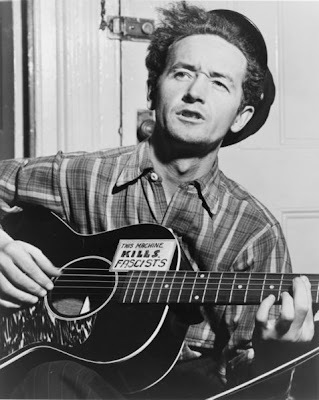 Legendary American folk singer and songwriter Woody Guthrie was born on this date 96 years ago, in Okemah, Oklahoma. At age 52, he was picked up for vagrancy in New Jersey, and alcoholism or schizophrenia were suspected as underlying causes of his increasing erratic behavior and health changes. But at the Greystone Psychiatric Hospital he was instead diagnosed with Huntington's Chorea (now known as Huntington's Disease)--an incurable degenerative neurological condition. He died thirteen years later, at a state hospital in Queens, NY. Guthrie's ex-wife went on to work with other affected families on securing funding for research into HD. This birthday gives me an opportunity to mention Alice Wexler's new book: The Woman Who Walked into the Sea: Huntington's and the Making of a Genetic Disease (Yale University Press, available September 2008) takes the story of Huntington's in America back long before Woody Guthrie, to the early 19th century, to the communities on Long Island where HD was a familiar reality in many leading local families. She follows the story of the disease through generations, through the eugenics era (where HD's strong genetic pattern made it an obvious subject of study), and into the present of genetic technology. Disability Blog Carnival #41 is up now! Retired Waif has posted the 41st edition of the Disability Blog Carnival, with the title "Death Becomes Her." Longtime Carnival readers may remember that the last time Retired Waif hosted an edition, she was nearly in labor (literally, reporting possible contractions in the course of the post itself!). This year, the theme is end-of-life issues: "It isn't nice and sweet, this carnival," she explains in the introduction. Indeed--but it is full of links to thoughtful, ambivalent, resolute, defiant, questioning, and wise posts, so settle in and have a read. Next edition is scheduled to be hosted by Greg at Pitt Rehab on July 24, and he's requesting your stories about "a memorable summer vacation/adventure/ordeal." Hm, I foresee a whole new definition of "summer break," and a swarm of jellyfish stings, airport mishaps, and sunscreen disasters. But then, I'm starting to look forward to September already.... Submit via any of the usual channels--the blogcarnival.com form (but beware the Captcha--still not accessible, grrrr), in comments here or at Greg's blog, or just put the phrase "disability blog carnival" in your post, and we'll probably find you somehow. 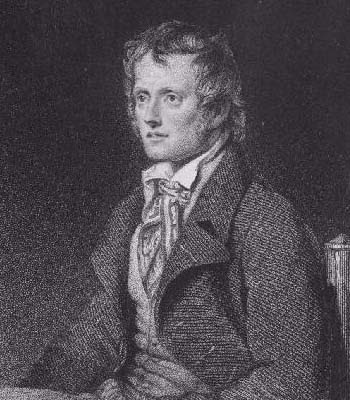 English poet John Clare was born on this date in 1793, in Helpston, near Peterborough. He was the son of a laborer, and himself a laborer, a gardener, who wrote poetry when he could, to be published by an acquaintance. His earnings were never enough to adequately support his wife and seven children (and his alcohol consumption); he experienced depression and later erratic behavior. In 1837 he was placed in a private asylum. After four years, he tried to live at home again, but his wife soon committed him again, this time to the Northampton General Lunatic Asylum, where he eventually died in 1864. It was at Northampton that he wrote his best known poem, "I Am," reflecting his sense of being abandoned by friends and loved ones, his vivid torments, and his longing for rest, "untroubling and untroubled." Austrian poet Christine Lavant was born on this date, the youngest in a big family based in a Carinthian village. Her father was a miner, her mother a seamstress. Christine was sick a lot as a kid--one infection damaged her vision when she was an infant, another made her deaf in one ear as a teenager; her face and neck bore the scars of experimental x-ray treatments; tuberculosis and depression were also in the mix. At 20, she was hospitalized for six weeks after a suicide attempt; in 1946 she recorded the experience in "Memoirs from a Madhouse," but wouldn't allow its publication until decades after her death. It's now available in an English translation (Ariadne Press 2004). Lavant became a highly respected poet in Austria, and won the Grand State Prize for Literature in 1970. One of her short stories, "Das Kind" (1948) is about a hospitalized child, bandaged, confused, lonely, dreaming of her family. 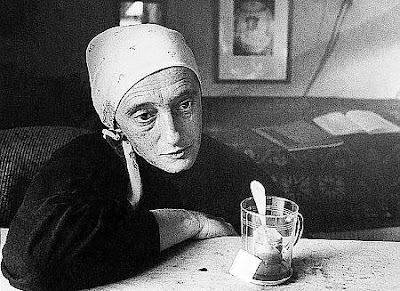 Her 1956 volume of poems, Der Bettlerschale (The Begging Bowl) reflects her themes of need, abandonment, alienation, and melacholy. 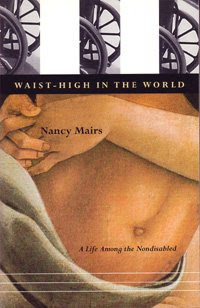 A 1978 collection of her poetry appears under the title Art Like Mine Is Only Crippled Life (from a quote by Lavant). There are English translations of a few Lavant poems here and here. "You know, if things are flashing by you, you don't have time to contemplate them and cherish them, you don't know that you're not doing it. And that's part of the reason why I refer to people that other people may refer to as able-bodied, as non-disabled. Because they lack disability. They have a whole element in their lives that they lack. And I have that element in my life. Because I wasn't born disabled, I also have grounds for comparison. I started my life as a non-disabled person, and I know my losses very sharply -- very painfully -- but I also know my gains." We are thrilled to announce that Unique Founder & Life President Edna Knight has been made an MBE in the Birthday Honours List 2008. Having founded the group in 1984 with 5 families, Edna has been a major driving force in its development. The award is for voluntary services to people with a chromosome disorder and their families. Congratulations Edna on a richly deserved award. I joined UNIQUE when my son was just a year old--because he has a rare chromosome disorder, and way back then (I mean 1996), there were no online discussion boards or blogs or listservs for families to meet each other and learn from each other. At the time, UNIQUE didn't have a way of collecting subscription fees in US dollars, so they just sent me the newsletter for free, for years. It was something amazing at the time, to see the founder's letter on the front page, and discover that she had raised two daughters with rare chromosome disorders (and two without, as well)--they were all adults by the time I subscribed, and just finding that they were living and thriving young women was a huge encouragement when I was first starting out. UNIQUE expanded my understanding of what was possible, and what was happening in the world, when I might otherwise have felt very isolated and fearful. So congratulations, Edna Knight! I've been thinking of this topic for a while, but in some convoluted way, maybe it will be timely for me to write about it as Independence Day is approaching. It is not a secret that the notion of independence for people with disabilities is a branch of the more traditional western ideologies of independence. When I would hear this line of reasoning I couldn't exactly appreciate the rationale behind it but the more mature (notice I didn't say older) that I become my remaining brain cells seem to be able to make the connection. Rugged individualism and Darwin's survival of the fittest unquestionably underlies the rehabilitation model of disability. The mantras which are osmotically filtered through rehabilitation centers and vocational rehabilitation offices include sacred words such as productivity, goal attainment, self sufficiency, etc. There are even scales to measure one's status in each of these areas as if productivity is a fixed concrete universal indicator. It is curious how serious these abstractions are taken. Not even one's vital signs are expected to as static and predictable. In thinking about independence and the importance that is placed of this ephemeral state, it dawned on me that it is not only at the crux of rehabilitation philosophy but it is also embedded in a different way in consumer advocacy. Independent living is a philosophy that over the years has become a regimented mode of living not so much from an imposition of the advocacy community but more so from each individual who imposes standards of independent living on their own life experience. One of the most difficult acts that a person with a severe disability must do is admit that they need help especially if it is outside of the realm of what they have been proven capable of doing themselves. We who have grown up in the independent living movement which started in the late 1960's feel that we are obligated to live up to and live in to what we so undauntedly advocated. Sometimes, lying in my bed in my own apartment I think to myself "this is what I so strongly fought for... the opportunity to live alone, to not always be able to perform natural bodily functions in a timely manner and above all the fact that my family could say yes, my sister lives alone and doesn't need help from us." If this is sounding a bit sarcastic, it is not meant to diminish the hard earned supports and services that allow people to live in a community. Neither is it meant to cast a dark shadow on the basic principles of one living as autonomously as they wish. So what is my post intended to evoke or to inform? I guess the fact that many of us with disabilities strive so unrelentlessly to attain a goal that in many ways becomes a little murky. Independence should not mean always needing to be in control, to be the best at one's game, to never "bother others with our needs as if they don't exist because we have gone through the metamorphosis of becoming independent." The more I learn about other cultures, the more I reflect upon the beauty and cohesiveness that is a result of family and community, the reciprocity and healthy art of being cared for and caring for another. Well, doesn't that sound radically and wonderfully refreshing?